Securely stows gear and supplies to keep them dry and organized. 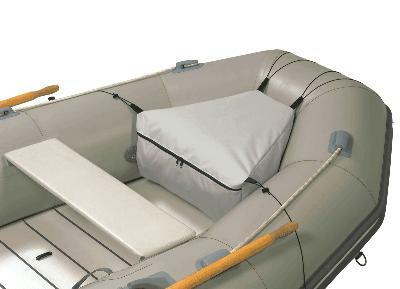 Sturdy locking shock cords attach easily to D-ring and eyelets on inflatable boat. Zippers are made using YKK Zippers. Fabric is coated Custom Grade 600 Denier heavy- duty polyester. This fabric is durable and water repellant, yet breathable to resist mildew. Dimensions: 17" long from front to back, 11 1/4" wide at bow, 25 1/2" wide at back, and 11" deep.